One of my go-to’s when I want to eat, or need a snack is gelatin. It’s good for your hair, skin and nails and is a source of protein. Since I try to avoid sugar, aspartame and sucralose, I use stevia, but stevia sweetened goodies are hard to find. 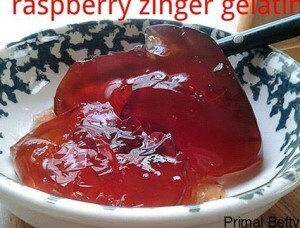 Here is my recipe for Raspberry Zinger Gelatin. It uses Celestial Seasonings Raspberry Zinger tea, stevia and unflavored gelatin. Pour 1 cup cold water into a large bowl, add stevia and then add gelatin and allow it to bloom for 1 minute. In a small pan, bring 3 cups water and 4 teabags to a near boil, stirring often to steep.